Monarch high school coach Jimmy Dexter is humble when talking about what his team accomplished at the USA Hockey High School Nationals from March 17-21 out in Reston, Va.
A silver medal and second-place finish, though, certainly is a fine finish to a season that saw Monarch go 22-1, losing in the state championship game to Regis Jesuit. In Reston, Monarch lost 8-7 in overtime in the Combined Division (more than one school’s players on one team) championship game March 21 to Florida’s JW Mitchell High School. Needless to say, the game was a roller coaster that saw Monarch score three in the first period, one in the second and the only three in the third to knot the game at 7-all. JW Mitchell scored all its goals in the second period and then the OT winner 10:40 into the extra session. 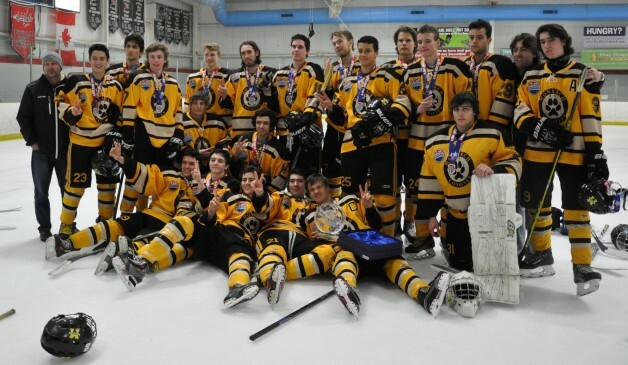 Monarch earned the berth to the national tournament after winning the Colorado Prep Hockey League by beating, ironically enough, Regis Jesuit in the finals. “It’s always been a battle with them,” Dexter said. At nationals, Monarch finished first in their pool with a perfect 3-0 record, getting wins over Newark (Ohio), Northwest (Md.) and Smithtown/Hauppage (N.Y.). Monarch then blitzed Bozeman (Mont.) 9-0 in the quarterfinals before ousting the Omaha (Neb.) Jr. Lancers 9-2 in the semifinals. Cherry Creek High School also qualified for the Combined tournament, finishing with an overtime win, regulation loss and overtime loss and did not make the quarterfinals. Chery Creek’s one win was against Dayton (Ohio) on the second day of the tournament on March 18. On the Utah side, Davis County finished with a 1-2 record, their one win coming March 19 against Rock Ridge/Riverside, a Virginia school. In the national final, seeing 15 goals scored made for a busy day for the official scorekeeper. Monarch jumped out to a 3-0 lead after one period on goals from Adam Tybor, Jake Young and Blake Bride. Then JW Mitchell posted their seven in the second with a Tybor goal squeezed in at the 14:36 mark of the period. In the third period, Brendan Van Haute struck for two goals in a span of 15 seconds (5:32 and 5:47) to make it a 7-6 game and then Bride’s goal at 15:10 tied the contest and send it to overtime. Zachary Harrison’s second goal of the game won it for JW Mitchell. Van Haute finished with a five-point game (two goals, three assists), Young added four points (goal, three assists) and Keegan Lewis added two assists to go along with the two-goal games from Tybor and Bride. Monarch goalie Hunter Ingino made 18 saves in the game. Dexter said going to nationals meant the only expectation was to play a team game and when that happens, good things generally happen. Regis Jesuit, who defeated Monarch 6-1 in the state finals on March 5, also traveled to Reston and finished with a win, a regulation loss and an OT loss in the Pure Division (all players from one school). The Raiders beat Bethel Park (Pa.) 4-2 on March 17. Out of the Utah ranks, Viewmont put together a 1-2-0 mark in the Pure Division, winning 5-1 against Desert Vista (Ariz.) on March 19.